Allows for straight through passage of the cartons when batch inverting is not required without the need to remove the MFA™ unit. The MFA™ lock/auto bottom batch inverting system, allow for the inverting of precisely counted batches of various thicknesses, types and styles of lock/auto bottom cartons with re-shingling of the cartons for semi or auto packing. 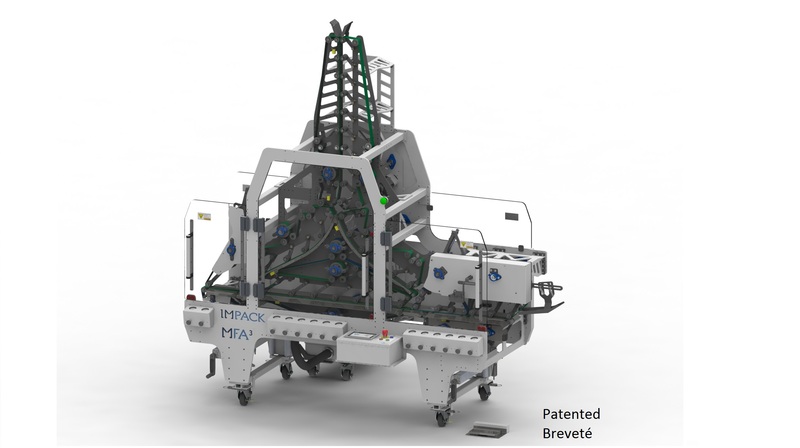 The patented MFA™ system from Impack can be used in line with the Impack Ergosa and Virtuo packers, as well as some auto packers from other manufacturers. The MFA™ system includes a bypass mode (non inverting mode) that allows the production of straight line, 4 and 6 corner and other type of cartons, not requiring inverting, with no restriction to production speed. Available with many options for different types and sizes of lock/auto bottoms folding carton boxes, the MFA™ is by far the most simple, flexible and economical solution available on the market.